Etsy SEO. It’s one of those things that EVERYBODY talks about, but no one is willing to tell you exactly how to do it. Today I'm talking about what it is, why it matters, and how to own it like a boss. Enter your name and email address below to download your FREE copy of The Ultimate SEO Checklist! First off, why the heck does it even matter? Let's take a look at my first 6 months of sales with LittleHighbury-- over $50,000. And guess what? The only "marketing strategy" I invested in at that point was SEO. SEO, or search engine optimization, is simply the way that people find your product on Etsy. Have good SEO and Etsy will reward you by directing more and more customers to your Etsy shop. Bad SEO? You can forget about views, much less a sale. It’s an absolutely CRITICAL piece to the Etsy puzzle and one you should definitely take care of in the beginning stages of your Etsy shop. SEO utilized “keywords” (which is just a fancy way of saying “one-two word phrases that describe your item”) to help get your items found. These keywords are the ones you should be using in your titles + tags as well as your product description. That being said, SEO is the holy grail of selling on Etsy. It’s the quickest + easiest way to sell more product and get your shop in front of an audience. It’s also awesome because unlike social media, taking care of your SEO for your shop is kind of a one-time thing—just check in on it 1-2x/year, make a couple of changes if needed, and you’re good to go. Now how does that sound for a marketing strategy?! Here’s the thing: You can look at just about any Etsy article and they will all tell you to choose good keywords. But what does that actually mean? What makes one keyword better than another? By using some keyword research tools, you’ll be able to quickly identify what phrases don’t resonate with buyers, what phrases do, and find out what words to substitute in to make it SEO friendly. But where to find these infamous keywords? If Google Keyword Planner stresses you out (it sure did for me the first time I used it! ), then Marmalead is a GREAT choice for finding your keywords. Even though I know how to use both, I’ll be honest and say that this is my go-to tool because it is designed specifically for Etsy-- which is where I focus the majority of my efforts. ...and that’s seriously just the tip of the iceberg! And the best part? You don’t have to read through tons of mumbo-jumbo jargon-- they keep everything really user-friendly and easy-to-read. Oh, and color coded so you can tell at a glance what the best keywords for your products are. Highly, highly recommend. This is the industry standard for keyword research because it keeps record of ALL internet keyword terms that people are searching for. It’s free, easy to use, and guess what? Search terms that are popular with the Google Keyword Planner are also popular to the same degree on Etsy. It’s also useful because if you are working to improve your Etsy SEO, chances are you’re not opposed to improving your overall SEO while you’re at it (less work with improved results? Yes, please!). By using the Google Keyword Planner tool, you’re not just looking at the millions of Etsy search terms-- you’re looking at the BILLIONS of search terms on the Internet-- and I guarantee you’ll find ones you never even thought of! I’ll fully disclose that I’ve never used this particular tool (I’m strictly a Google keywords/Marmalead kind of Etsy seller ;), but I’ve heard great things on both the Etsy forums as well as from previous clients. It definitely isn’t a replacement for either Google Keyword Planner or Marmalead, but if you’re just getting started out and looking for a user-friendly, FREE tool, Etsy Rank is the way to go. It’s not as robust as some of the other tools out there, but with a little work, it can absolutely help your items rank a lot better with improved SEO. Pinterest is a great one to use when you’re just starting to brainstorm out keywords to use for your listings. It’s like using the Etsy search method, in the sense that you’ll start typing in a keyword phrase that you think a buyer might use to search with. A drop down menu with a bunch of keyword suggestions will then drop down-- in order from most popular to least. This can be a great brainstorming tool to help you in gathering your keywords before analysis. Be wary of this one-- if you spend any amount of time on the Etsy forums, you’ll probably see a lot of people recommend typing in keywords in the Etsy search bar and then writing down what pops down below them and to use those keywords. Here’s the thing: Those suggestions from Etsy? They’re only the very, very recent terms that have been searched for and don’t actually reflect the best keywords to use for your products. You’ll find MUCH more success utilizing a tool like Google Keywords or Marmalead for finding your keywords. You have 140 characters to fill for each of your items’ titles (and make sure you use them all! ), but the first 40 are ABSOLUTELY CRITICAL for your SEO success, both on Etsy and Google. Buyers only get a glimpse of your item’s title through search-- they have to click through to the actual item to see the full title, so they better know what you’re offering in those first few characters of the item’s title. 3 | Using 1 - 2 highly targeted keyword phrases and 1 -2 broad/general keyword phrases first. After A LOT of experimenting around with this, talked with A LOT of other Etsy sellers and would absolutely recommend the following: Do both! I have found the most success through researching both general + focused keyword phrases and then including a healthy mix of both of them within the first 40 characters of each listing. You’ll want to include 1-2 highly targeted keyword phrases + 1-2 broad/general keyword phrases at the beginning of each of your listings. Doing your keyword research (I know, I keep bringing that up! It’s super important, can you tell?) will make all the difference in coming up with effective keywords for both categories. 4 | Make sure your titles + tags match EXACTLY. One common mistake I see with beginning Etsy sellers is that if you use different keywords in your title vs tags, you’ll appear in search for even more terms. After all, the more variety of keywords, the more chances you have of something choosing to search for at least one of those terms. I promise you that if you go into Etsy with that mentality, you will be sorely disappointed. Your titles + tags need to match EXACTLY. Whatever you are putting into your title needs to be duplicated below in your tags. Note- some keyword phrases used in your listing title will be too long (max 20 characters) for keyword phrases in your tags--to work around this, break up your keyword phrases into 2-3 slightly shorter phrases (ie- “Sterling Silver Jewelry” can become “Sterling Silver” and “Silver Jewelry”) for maximum SEO effectiveness. You'll also most likely have more tags available than you know what to do with. Take the words within your listing title and mix them up + combine them in different ways to create additional tags that are still using the same basic keywords. Yes, they absolutely need to mimic your item’s title word-for-word, but unlike the title, they do not have to be in any specific order--Etsy will give the same value to each keyword, regardless of where it is in your list of tags. So stop worrying about trying to get everything to show up in order-- as long as you have matching keywords somewhere in your tags, you are good to go! 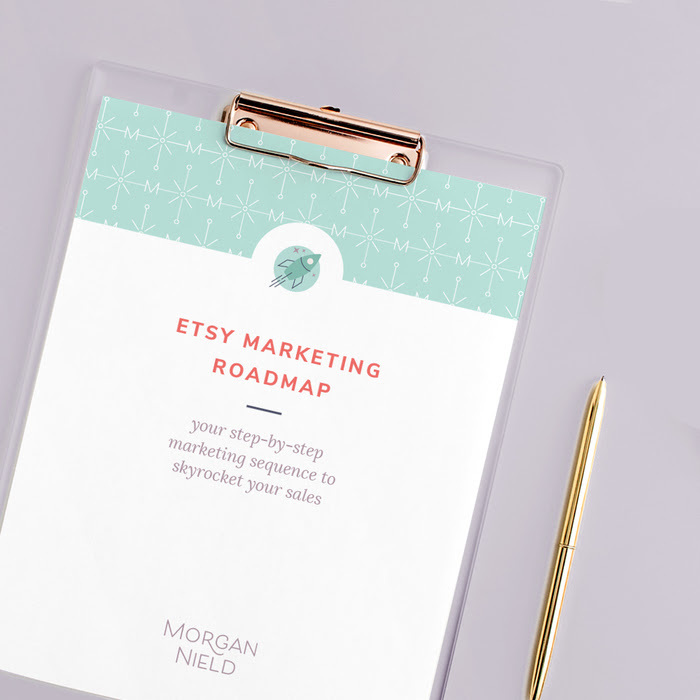 This is a little-known strategy that can have a HUGE impact on your Etsy SEO results. I discovered this one accidentally (because I became a little bit lazy with my titles…), but it is so ridiculously effective!! Brainstorm (AKA use a keyword planning tool!) 5-10 different keyword phrases that you would like to rank for. You’ll want good, strong keyword phrases that accurately describe the items in your shop, but also perform well in keyword analysis (meaning that engagement is high + competition isn’t overly-saturated). So have you got your keyword phrases written down? Awesome! Now start thinking of each of those keyword phrases as a sort of "container"-- you’re going to go through each of your listings and place them in the 3 “container(s)” that best describe that specific item. (Why 3? Because focusing on too many keywords can water-down a listing-- I find that targeting around 3 keywords/listing keeps things focused + ranks higher in Etsy search). Newborn baby swaddle / baby blanket / baby shower gift for girl / …..
Like it or not, Etsy rewards recency with higher placement in search. This means that every time an item auto-renews (after a sale, for example), it comes back into search at a higher ranking. This is also good news for adding new items to your shop-- Etsy likes shops that are consistently adding new product and will give each new product listing a boost just for the fact that it’s new. You can “fool” Etsy into ranking you higher by renewing your listings manually (or using a website like www.etsyonsale.com) from time to time. The most important thing to note here is that you’ll want to renew your items at peak traffic times-- times when your target audience is online and shopping. If you’re renewing them at 2 a.m., chances are that they will get buried again before your potential customers even wake up for the day. Chart your peak traffic times (easy to do in your Etsy stats-- just look for the spikes in views) and set up your renewals accordingly. This tip isn’t so much SEO (although it is important to have spaces between your words + punctuations so that Etsy doesn’t read them as onesuperlongword (← see what I did there?!). But in terms of converting browsing shoppers into buyers, it’s important that your item’s titles are easy to read and broken up into segments so that a browsing customer can quickly glance at your item in Etsy search and immediately know what you are selling. Note-- Etsy SEO doesn’t care if you use “,” “/” “|” or whatever else you choose to separate keyword phrases, just as an FYI :) I prefer “/” just because it’s my style, but if I suddenly changed over to “,” it wouldn’t affect my ranking at all. I love SEO because it’s a “set it and forget it” marketing technique, but it does need upkeep from time to time (I recommend checking in every 4-6 months, or whenever you see a major dip in views). The best way to keep your SEO in tip-top shape is to track your top performers over time and then make adjustments as you see fluctuations in views. It’s pretty simple to do-- just make a list of your top 10 items (based on # of views) and record each week how that particular listing is doing. There will be slight fluctuations from day to day, but overall things should stay relatively stable once you've got your SEO in place (if you're playing around with SEO, expect some major changes for those first few weeks). Marmalead can help you track your items, but another awesome tool is Etsy Gadget--it will tell you EXACTLY where your products can be found within Etsy search. If/when you notice a particular product drop significantly within Etsy (like 3-4 pages back from where it usually is) that extends for a couple of days, the best thing you can do is to deactivate that listing and create a new one to replace it. Now this isn’t that kind of spammy link-stuffing you see on the web— this is real-deal networking and getting your shop featured on different blogs + websites. Etsy loves it when you bring traffic into their site, and they’ll reward you for it with higher search placement. Win-win! The KEY to making this work is to find bloggers/influencers who share the same target market as you to feature your product. You are NOT going to pitch to any old website. I don't care how many followers/fans they have, if that audience is not an audience that would obviously be interested in your product, then don't pitch to them! Yes, they may feature you, but it's not going to be nearly as effective as pitching to a smaller, more targeted influencer. Find bloggers out there whose audience you love (and you know would love your products!) and get working on befriending them! Make sure you are following them on their blog + social media channels and then make an effort to comment and share their work. Give, give, give then ask. After a couple weeks of "giving", pitch your product to them (short + sweet-- they most likely get multiple emails/day!) and cross your fingers! 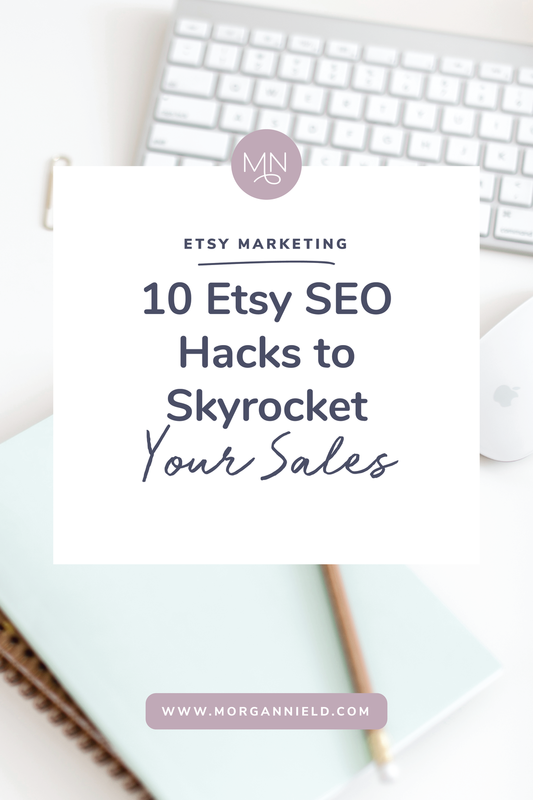 These Etsy SEO hacks aren't meant as a quick-fix-- and while you may be lucky enough to see a drastic change in results in a few minutes, chances are that you're going to have to sit and wait for a couple of days (for older, established shops with high sales) or a few weeks (for newer shops with few sales). So be patient, keep trying + experimenting, and I PROMISE that you will see results! Have you joined my FREE Facebook group? If not, you should :) It's filled with all your future Etsy BFF's and a FANTASTIC place to get feedback on your Etsy SEO. Oh, and I do a FREE masterclass live-stream every Friday that I think you'll love :) You can request to join the group here!